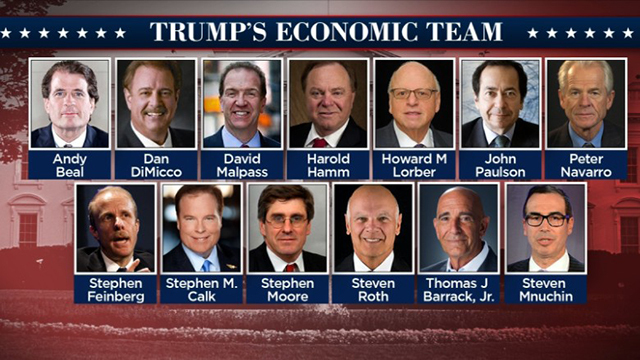 When Republican Presidential nominee Donald J. Trump named his economic team recently, of the 13-member group announced there was not a single woman among them. There were however, six men named Steve. Trump issued a press release to announce his selections. In it he claimed the team he selected included some of the top economists in the country as well as the most successful industry leaders in finance, real estate and technology. Among those named were several individuals well known among those who influence conservative economic policy. Included among the “Steves” are Stephen M. Calk, Banker; Steve Feinberg, financier; Steven Miller, a former aide to Sen. Jeff Sessions of Alabama; Steven Mnuchin, Trump's national finance director, who is chairman and CEO of the investing firm Dune Capital Management; Stephen Moore, the founder of the Club for Growth; and Steve Roth founder and CEO of Vornado Realty Trust; banker. Other members of Trump’s economic team include Peter Navarro of the University of California at Irvine; David Malpass, who served in the Reagan and George H.W. Bush administrations; and Harold Hamm, a self-made oil billionaire who was a top energy adviser to Mitt Romney's 2012 presidential campaign; Dan DiMicco, a former CEO of steelmaker Nucor; Steve Roth, founder and CEO of Vornado Realty Trust; hedge fund billionaire John Paulson; Howard Lorber, CEO of the Vector Group in Florida; real estate investor Tom Barrack; banker Andy Beal; and financier Steve Feinberg. Trump attempted to press his position as a political outsider because other than Hamm, none of the others listed were named as part of the economic policy teams of the last three Republican Presidential nominees according to a Washington Post report. However, his actual policy proposals were much of the same Republican ideology. Although Trump continued to claim he is not a traditional politician, his policy speech was full of economic policy ideas reflective of previous Republican administrations—according to many economists, they will primarily benefit the rich. For example, he announced a plan to cut individual income tax rates, with a top rate of 33 percent and put an end the so-called death tax.